The light in Alaska‘s summer is a stunning revelation, a never-setting sun that keeps you awake for hours longer than your body thinks it can manage. The payoff is in the increased number of daylight hours you are able to spend enjoying the thrill, discovery, and exquisitely beautiful landscapes of this place. 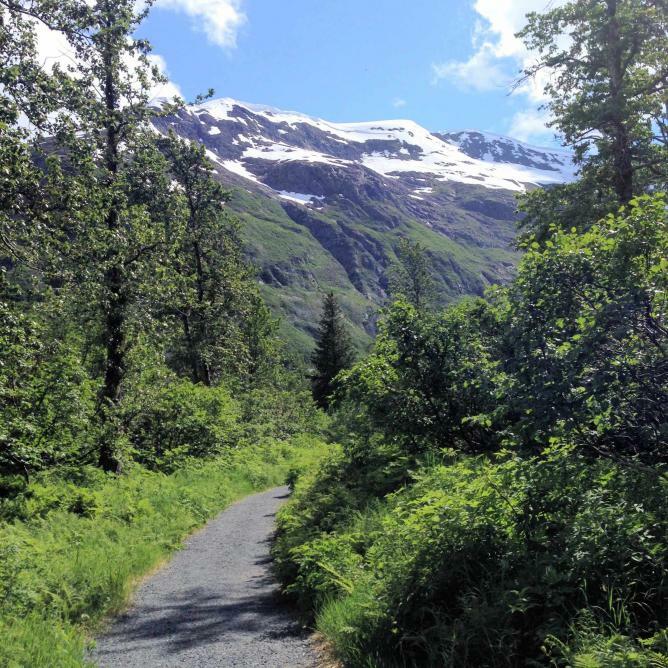 Here are 5 of the best hikes in the greater Anchorage area that will get you into the landscape to see, feel and sense the gorgeous delights of Alaska’s scenery. 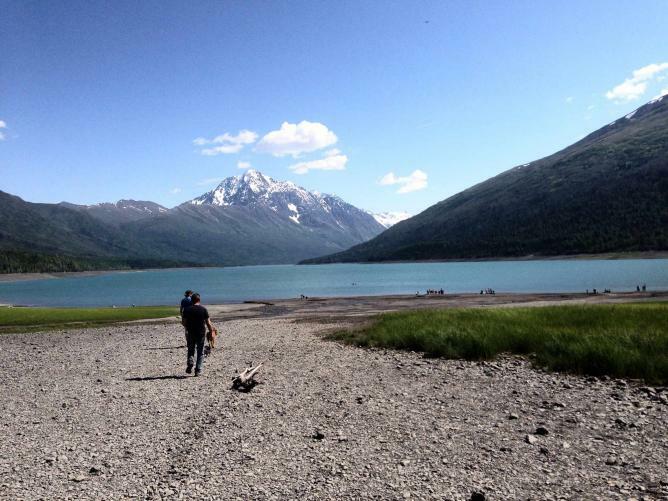 Eklutna Lake is a recreational lake for kayaking, paddle boarding, canoeing, and, if you can brave the chilly water, for swimming. It’s an easy drive in, and a short walk to the water; the length of the shoreline is long enough to take a good trek around its perimeter. The thrill here–and it truly is a thrill–is the long length of hardened mud at the lake’s edge. Come with your old ratty bathing suit, and near the water’s edge, you’ll find the best slathering mud around. Better than Calistoga, this mud is filled with rich minerals from the scree that falls from the steep slopes nearby. What’s stunning about the lake view are the glacial peaks that frame the far edge of its waters, giving the impression that the peaks jut right out of the lake’s edge. It’s a picture-perfect landscape, and if you come towards the end of the day–meaning any time between 4:00 and 10:00 PM, you’ll watch the delicate changes in the sky’s color descend upon the landscape. It’s a fine place to bring a picnic, take a long walk around the lake, take a mud bath, and rinse it all off in the crisp, chilly water. Don’t miss the tiny ice cream stand on the road out, which has the best wild Alaskan blueberry ice cream you’ve ever had in your life. Just outside the small town of Eagle River, a few minutes from Anchorage, is a picturesque, flat walking hike surrounding Beach Lake. Beach Lake is a gorgeous locale with a vibrant blue expanse of water that’s surrounded by mountains. It’s easy enough to park very close to the trailhead, and then head out through the green brush along the lake’s path. It’s so scenic that you’ll think you’re inside a postcard image, but keep walking all the way around the lake to the small sand beach, and take in the view from the other side—a panorama of lush green and rocky terrain. Then bushwhack a bit through the small isthmus of sand and dirt to the sound–a slice of ocean that’s just a stone’s throw from the lake’s edge–and view the sweeping expanse of ocean water flowing in rivulets between sandbars. Encounter geological elegance at its best, lake and ocean water within just steps of each other. Beach Lake is an easy walk and a great way to start your Alaskan adventure, and you’ll be rewarded for your simple efforts with exquisite and sensational views. Not to be missed! Thunderbird Falls is located in Chugach State Park, and is well-traveled by locals and visitors alike. Also near Eagle River, the hike is an easy incline up with built-in viewpoints that overlook a rushing waterfall. It’s about a 30-minute walk to the view of the falls, and there’s a lovely park deck that allows the spray of the waterfall below to mist your face. Head down the slightly steep path to the rushing river, and to the back corner of the path at the apex of the waterfall. Watch the stones–they’re slippery–but don’t let that stop you from getting in the water or balancing across the flat rocks just under the waterfall’s dramatic drop. If it’s hot, take of your shoes and let the icy water cool your feet, arms and legs. Thunderbird Falls is a charming, simple day hike to get yourself out in nature, feel the greenery growing up around you, and view the delights of Alaska’s simple enchantments. Just south of Anchorage off the highway that leads to the little town of Seward, veer off the main road to Byron and Portage Glaciers. It’s a simple, flat, easy, fifteen-minute walk to the first observation point, and the view is spectacular. At the beginning of summer, ice caves will still be present at the base of the glacier. Glaciers, you learn in Alaska, are made up of an icy, blue-colored water–different from the milky hue of regular ice. Glaciers form in the crevasses of mountains, identified by their telltale turquoise tint, and move slowly and deliberately—until they don’t. In summer, their ice is melting, which can give way to rumbling avalanches depending on the altitude. Standing at the base of a glacier is a humbling experience. The vast frozen water that flowed through the earth’s surface at one time in our history formed everything we see in the world’s geology. And though we may know this from textbook learning, when we’re standing at the base of a glacier, witnessing its power and grace, it feels bigger than that factual information. It is a serenely spiritual and godlike sensation. Byron Glacier is a must-see, and worth the simple trek to see it. And, if you’re game, you’ll want to climb over the boulder field (simple hand to feet climbing), and stand at the very base of its majesty. It will be a moment you’ll never forget. 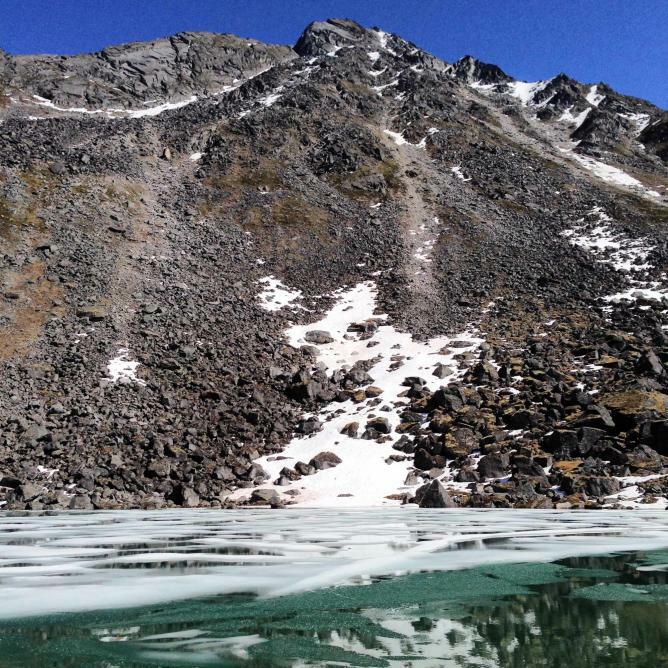 Arctic Lake is a four-hour hike (up and down), and just a short drive from Anchorage, with a trailhead that begins at the base of a ski mountain. The foliage here is short scrub, which makes for easy climbing, but the incline is good and sharp, which makes for a terrific and sometimes windy climb. 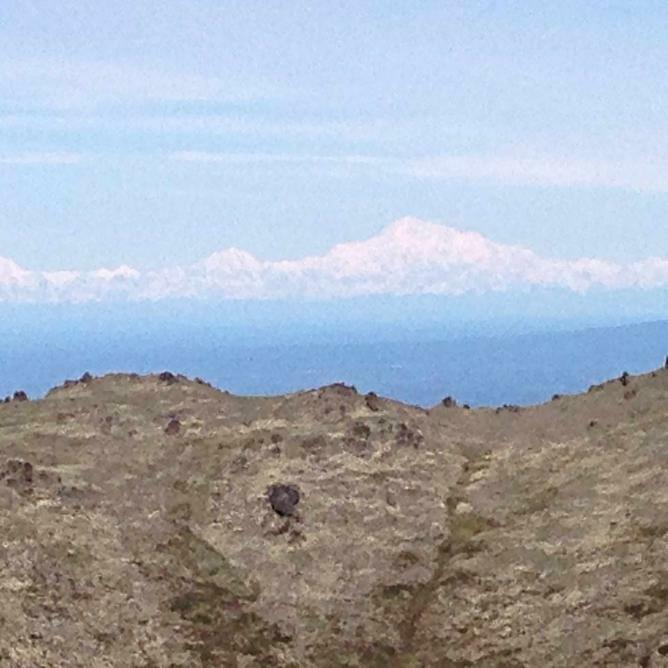 Behold sweeping views of Mount McKinley, and the lavender and turquoise hues of the sky across the peaks. Stand on the top of the mountain and look down a sharp, 200-mile-long gorge, all the way across the valley to a view of Denali. It’s a rare thing to have a straight-shot view of the mountain–it’s usually somewhat cloudy or hazy–so pick your day well and you’ll be rewarded with an unprecedented, sweeping panorama and a view of the mystical mountain. The sky is a revelation here, with white streaking clouds that make you feel as if you’re about to take flight. The air is crisp and cleaner than in “the lower 48 states.” Lakes gather at the base of many of the peaks—the green-green of glacier lakes and the blue-blue of runoff lakes as vibrant as anything nature offers. This is the place to see the exceptional grace of Alaska’s perfect mountain ranges. Hatcher Pass is a 15-mile, eight-hour hike that is both physically challenging and worth the effort. Hike from 1500 feet to 4000 feet, along trails filled first with wildflowers and glacier runoff, and then, over scree-filled mountain paths, boulder fields and open meadow. Water follows you the whole way, starting with the small streams, and then on each plateau and each level of the hike, deepening into pools and ice lakes with the telltale fluorescent green water of glacier runoff. The payoff–after six hours of hiking up–is Reed Lake, a phosphorescent, electric-green body of water at the base of a black mountain, filled with small flotillas of ice. Just above the lake is a broad lookout point, with a rushing waterfall the width of the entire rock formation. The falls are a good hundred feet wide, and it is possible to climb the path, wade across the top of the falls, and from here, take in a sweeping view of the entire valley. If you dare, take a dip into one of the glacier pools. “Cold” does not begin to encompass the feeling of this water: it bites, freezes and chills with a crispness not known in other terrains. Drink from the streams, and enjoy some of the coldest, purest water in the world. On the eight-hour trek, expect to meet few travelers along the way. This is wilderness at its best: vast, open, unspoiled and all yours. Alaska lives up to every bit of its lore. It’s an adventurer’s paradise and a trekker’s dream. If it’s calling you, don’t wait. This land of glacial majesty is everything you’ve ever imagined and more.